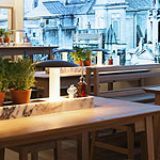 Vapiano offers an innovative way in which to enjoy quintessential Italian cuisine. On arrival at the restaurant, you receive a bank-like chip card which is used to order your meal at your own pace. 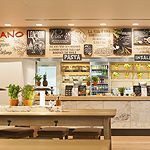 Signature dishes at Vapiano include e fichi pizza with prosciutto and fresh figs; strawberry, goat's cheese and fresh spinach salad; and popular pasta dishes include campi e spinachi; and pesto basilica.